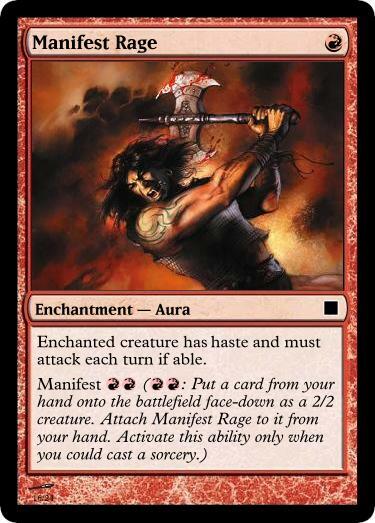 3/09/2011 - I originally posted this on the Wizards Wiki in January but Living Weapon Week on dailymtg.com got me thinking about it again so I rewrote it and re-posted it here. All of the cards have been refined and new ones added. When the living weapon mechanic was revealed, it inspired me to think more about incarnate and its variations. (If you don't know what I'm talking about, check out the first couple weeks of #GDS2. In short, incarnate is the aura mechanic that allows you to generate a creature to enchant when you otherwise couldn't). The choice of 0/0 germ tokens for living weapon seems to support Jonathan Woodward's execution. It's unique and makes it trivial to determine the power and toughness of the resulting creature but I still feel that there is room for another solution. Add to that the fact that 0/0 is now something that has already been done in this realm and we are more or less compelled to find that alternate solution. I originally set manifest costs rather aggressively for a creature with the resulting stats since it costs you two cards to make a monster this way. 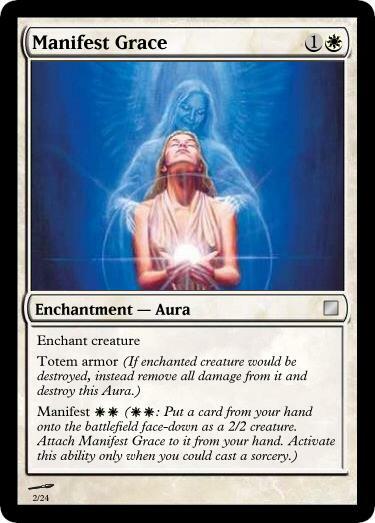 That made it a better option to play the aura through manifest as long as you had a low-value or dead card in your hand. 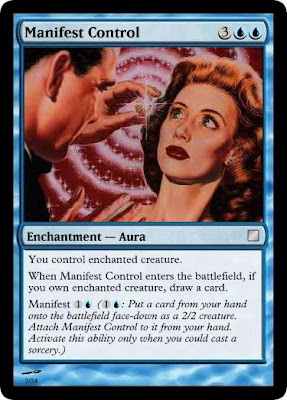 As I'll discuss more later, that was bad design, so I made the manifest costs about right for the resulting creature ignoring the added cost of another card. I was torn as to whether manifest should be released in the same block that morph returns in. 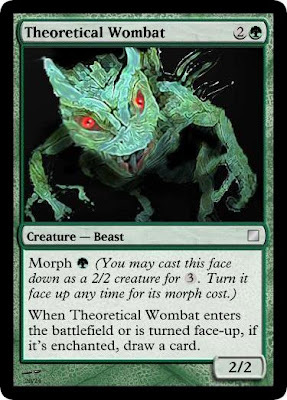 If morph isn't in the set, it will take more effort to teach/remind the players what a face-down card is. 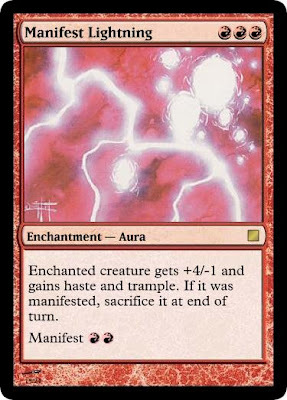 If morph is in the set, the manifest costs may need to be nerfed since manifesting a card that actually has morph will save you the initial downpayment of 3 mana. I also worried that it will take away the "I'm so clever" moment when a player realizes he can mix morph cards with manifest cards. 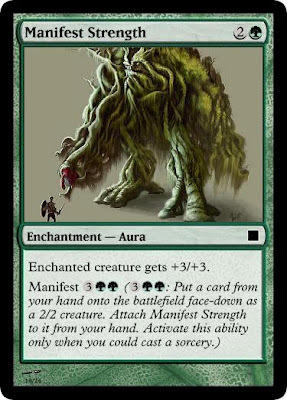 I settled on the conclusion that manifest should go in a set with morph: The face-down creature thing is just too weird without morph in the picture and players will still have the aha moment, it'll just be smaller and come sooner. 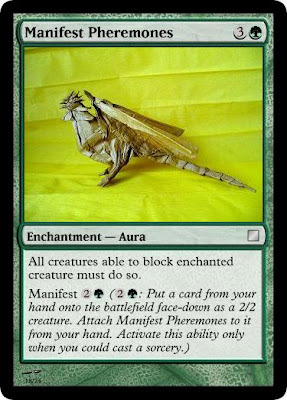 The concern around manifest costs being too low in a set with morph was alleviated when I raised those costs all around, so it shouldn't be a problem, but only playtesting can show what really fits. 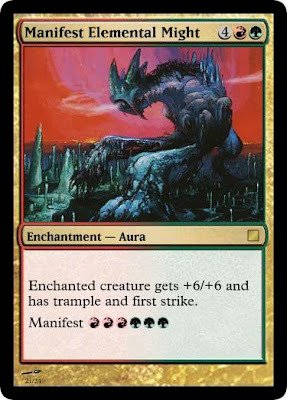 I also like that these cards effectively allow for more interesting and/or more aggressive costs to play morphs, helping align them with modern creature standards. 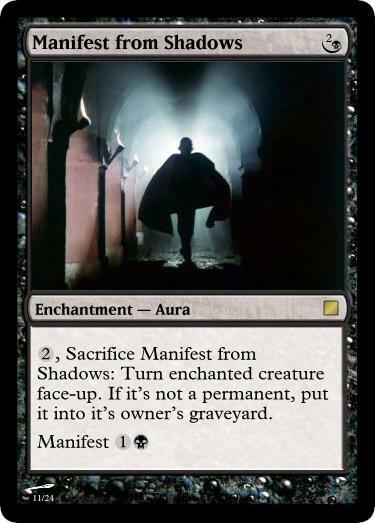 Jon Loucks had a similar intention with his card, Pit of Shadow, but this feels just a bit more natural. I draw my aura in ten games. 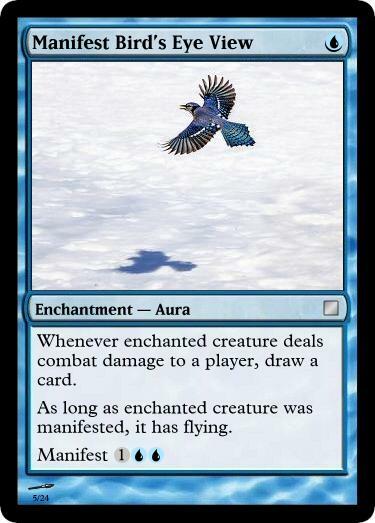 In six of those games I have one or more guys the aura would make better and I cast it on them. In the other four I have none. 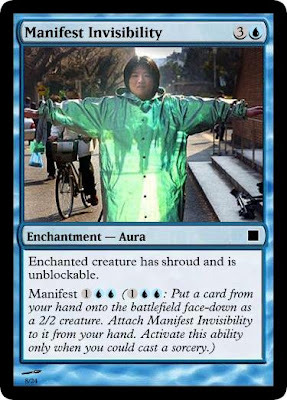 If my aura has incarnate, I get to play it in all ten games. Seems good right? "But," you might say, "just because I already have creatures on the board doesn't mean I don't want more. I might always use the aura to get another guy." A valid concern: one which can be designed around: Every incarnate aura should be—in a vacuum—more attractive to cast on an existing creature than to incarnate. Y'know, provided your existing creature isn't some vanilla 1/1. 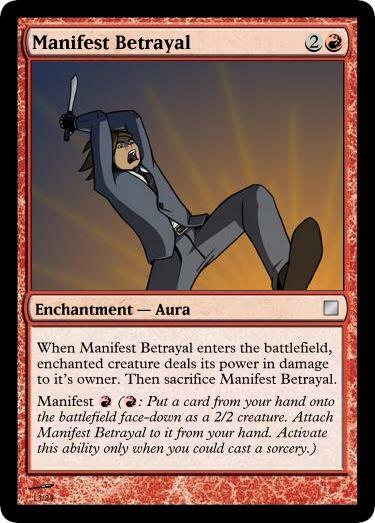 Now you know why the manifest costs aren't cheaper. Even if I've convinced you that incarnate is a good thing when designed well, I still need to defend lack-of-variance. Yes, variance is crucial to the game (read: all games), but remember that too much variance is also the ruin of games. A game must hit the sweet spot between too much and too little variance. 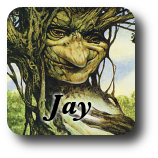 The Magic that I play (limited and standard) has somewhere between perfect and too much variance. I'm thinking it leans toward the latter and that pushing it the other way a bit would be a good thing. Cycling, occasional looting and similar smoothing mechanics exist in the exact same mindspace. In fact, if most mechanics are a variant of kicker, most other mechanics are a variant of cycling, and this is one of them. 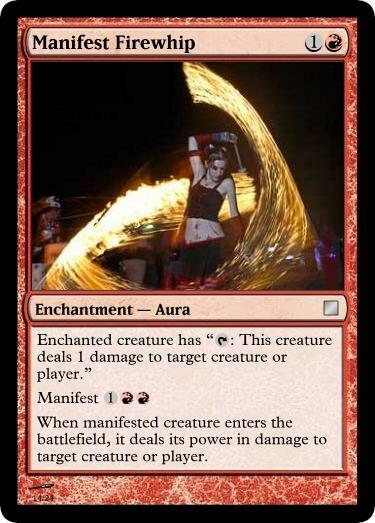 In the end, players don't like uncastable cards sitting in their hand and this set of mechanics solves that. Manifest does it while providing new kinds of creatures, which everyone loves. Here are a few cards that show some of the ways this mechanic could evolve over a block. I share these last few not as a proposal of cards that would ever remotely see print (the chance of a set having both hybrid and morph is practically nil) but just as more kindling for the fire. 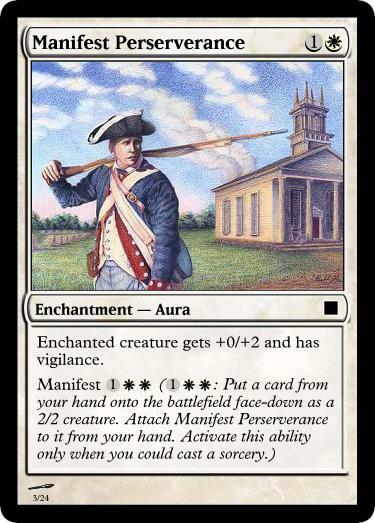 I'm going to have to bring up the omnipresent issue of NO INSTANTS OR SORCERIES ON THE BATTLEFIELD. 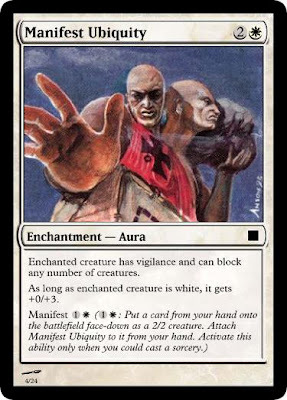 Using this face-down card from your hand method might seem clean in concept, but if you're using it in a block with normal morph cards, there ARE going to be ways of flipping the stuff you manifested face up. And that's a no-no. That issue in itself kills this implementation of Manifest. It's a fine effect, as living weapon shows, but this blends two fairly complex mechanics (entering the battlefield attached to a brand new object, and using face-down creatures) into one monster that, in addition, can easily create situations that wreak havoc on the rules. I don't see why the fact that living weapon uses 0/0s is a compelling reason to avoid them for manifest as well. If that solution is already shown to work, and work well, why change it? 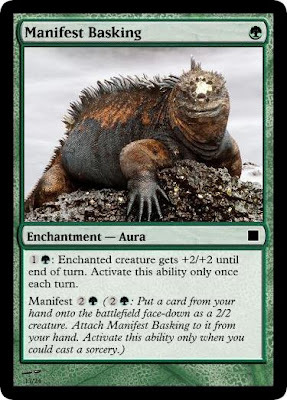 That complaint about Instants and Sorceries was brought up multiple times in the GDS2, but isn't it pretty trivial to fix? 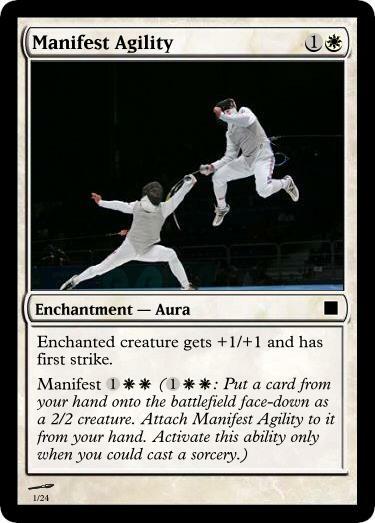 There's already a rule that if an Instant or Sorcery would be put onto the battlefield, exile it instead or some such. 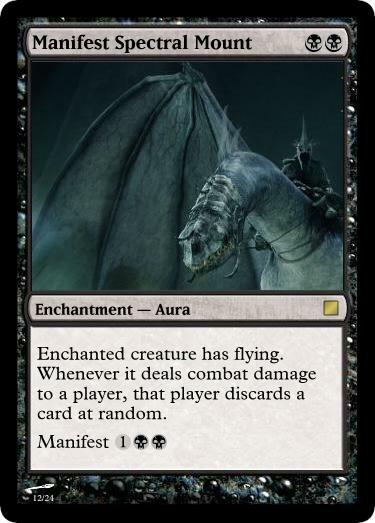 So just add a new rule that if an Instant or Sorcery is on the battlefield, put it into its owner's graveyard as a state-based effect. Problem solved. Are there corner cases that I'm missing? I honestly don't know if it's that simple. I'm no judge, and I don't know what exactly are all the complications, but something tells me that if there was a fix that easy it would already be in the rules. And even if the rules account for it, that doesn't change the fact that the situation in the first place is very weird and unintuitive. Avoiding it altogether if possible is preferable to allowing it to happen just because you want to take a shortcut. And the comments about complexity of the mechanic in general still stand. i like all the series of cards. The fact that a rule would have to be changed (and how hard that may or may not be) is not a reason to avoid exploring a design possibility: If the design is worth it, the rules will change. If not, you will have learned one more thing that won't work. Perhaps the failed design will lead to another design which does work. Whether that rule has already been changed or not even less so: Why change a rule before it's relevant? 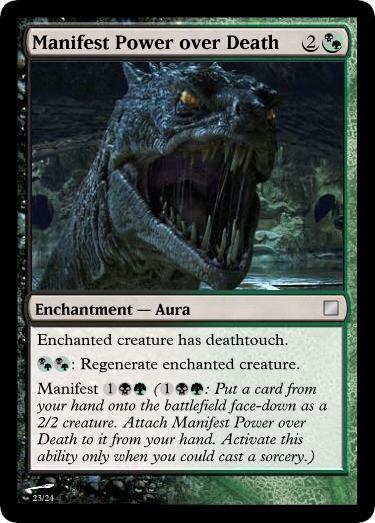 The difficulty behind changing this particular rule is not a technical one (non-permanent cards with morph would require only a trivial rules update), but rests on the ramifications of allowing a card without morph to be face-down: Specifically that it becomes much harder to prevent cheating by playing a non-morph as if it were a morph. 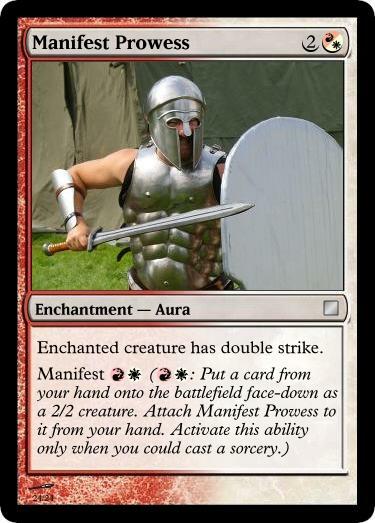 The scenario being that I've got a face-down card on the battlefield which got there via manifest, but the aura has since been disenchanted. 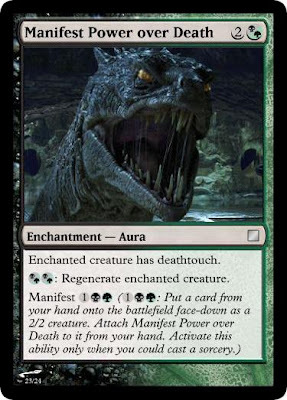 If that card happens to be a card with morph, I could now play any card in my hand face-down, claiming it's a card with morph, mix the two up and you wouldn't know I cheated unless you killed the first creature in response. 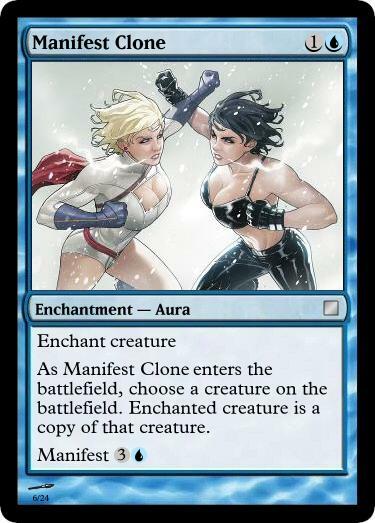 One possible solution is to allow manifest to put only cards with morph onto the battlefield. If so, you'd want to make sure there are a bunch of lands and—yes, maybe even instants and sorceries—with morph in the set. I don't love that solution because it limits the scope of manifest drastically. Another solution is to add text to the manifest cards that causes you to flip the enchanted creature face-up when the aura leaves play (or even to sacrifice them if the theme is that the aura is what granted that card life in the first place). 707.6. If you control multiple face-down spells or face-down permanents, you must ensure at all times that your face-down spells and permanents can be easily differentiated from each other. This includes, but is not limited to, knowing the order spells were cast, the order that face-down permanents entered the battlefield, which creature attacked last turn, and any other differences between face-down spells or permanents. Common methods for distinguishing between face-down objects include using counters or dice to mark the different objects, or clearly placing those objects in order on the table. Also, cards without morph can already be face down, thanks to Ixidron and Illusionary Mask.